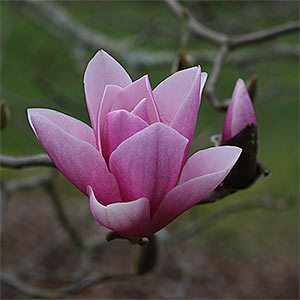 A magnificent small flowering tree, Magnolia soulangeana is commonly known as the ‘Saucer magnolia’. This is a deciduous hybrid magnolia (M. denudata x M. liliiflora) and makes an outstanding feature tree in any garden. A number of different varieties of this superb tree are available, many very small growing. Although over time Magnolia soulangeana can reach a height of 5 – 9 meters, and growth rate over the first few years is moderate, it does slow as the plant matures. Most of the newer cultivars are naturally smaller than this. These are a Magnolia with a naturally bushy habit, they require little pruning other than removal of damaged or dead wood. Plants will perform well in a humus rich moist well drained soil with protection from the afternoon sun. Best planted in autumn while the soil is still warm or in early spring. Larger flowers, and with more of a purple flush, long lasting and very attractive. Magnolia x soulangeana ‘Alba Superba’. More rounded or goblet shaped flowers deeper in colour to a rosey purple.